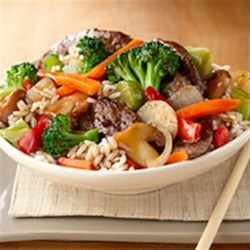 "A delicious beef and broccoli stir fry is on the table is less than 30 minutes with handy prepared veggies and rice." Heat oil in large nonstick skillet over medium-high heat and cook steak, stirring frequently, 6 minutes or until almost done. Remove steak; keep warm. Serve over prepared rice and sprinkle, if desired, with chopped peanuts. **Cook steak to an internal temperature of 145 degrees F as measured with a food thermometer; let rest 3 minutes. this was delicious. we used kikkoman stir fry sauce and it was very flavorful. I used a little more meat and sauce than required but it was amazing!